Colonel Kim Nichole Reed-Campbell (born June 6, 1975 in Honolulu, Hawaii) is a United States Air Force officer and Senior Pilot in the U.S. Air Force. She was decorated for piloting her A-10 Thunderbolt II back to base in southern Iraq after taking heavy anti-aircraft artillery (AAA) damage in aerial combat over Baghdad during Operation Iraqi Freedom in 2003. After her tour of duty in Iraq ended, Campbell gave lectures throughout the United States about her experience, including one at the National Air and Space Museum. Kim Campbell was promoted to the rank of Major in the autumn of 2006. Campbell is the daughter of the former mayor of San Jose (and former USAF Captain) Chuck Reed. She joined the Civil Air Patrol as a cadet at age 13 and made her first solo flight in a civilian aircraft over San Jose at age 16. She graduated with a Bachelor of Science degree from the United States Air Force Academy in 1997 where she was the cadet wing commander, as was her father during his time as a cadet at the Air Force Academy, the first time that a father and daughter both served as cadet wing commander. She holds a degree in International Security Studies from the University of Reading, United Kingdom, and a Masters in Business Administration from Imperial College London, United Kingdom, which she undertook while on a Marshall Scholarship. During a mission over Baghdad on April 7 2003, her aircraft suffered damage. "We did our job with the guys there on the ground, and as we were on our way out is when I felt the jet get hit. It was pretty obvious — it was loud... I lost all hydraulics instantaneously, and the jet rolled left and pointed toward the ground, which was an uncomfortable feeling over Baghdad. It didn't respond to any of my control inputs." She tried several procedures to get the aircraft under control, none of which worked; last, she put the plane into manual reversion, meaning she was flying the aircraft without hydraulics. The aircraft immediately responded. "The jet started climbing away from the ground, which was a good feeling because there was no way I wanted to eject over Baghdad." With some technical advice from her flight leader, Lieutenant Colonel Turner, she flew the injured plane for an hour back to the air base. "The jet was performing exceptionally well. I had no doubt in my mind I was going to land that airplane." Landing was tricky: "When you lose all the hydraulics, you don't have speed brakes, you don't have brakes, and you don't have steering." 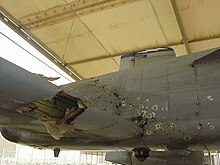 Kim Campbell's A-10 suffered extensive damage. For this action in aerial combat she was awarded the Distinguished Flying Cross. On the ground it was discovered that her A-10 had sustained damage to one engine and to the redundant hydraulic systems, disabling the flight controls, landing gear and brakes, and horizontal stabilizer. A detailed inspection revealed hundreds of holes in the airframe and that large sections of the stabilizer and hydraulic controls were missing. "She's one of the few pilots who ever landed the A-10 in the manual mode," said General Richard Myers, USAF, Chairman of the Joint Chiefs of Staff. ^ a b Irwin, Mark (Jan 19, 2018). "A Military Family". Rotary Club of Tucson. Archived from the original on 15 February 2019. Retrieved 15 February 2019. ^ Jane Erikson. "Her plane shot up over Iraq, Air Force captain completed a dangerous flight to safety". American valor. ^ "Colonel Kim Campbell". US Air Force Academy. Retrieved 15 February 2019. ^ Gottlieb, Allie (2003-02-20). "Captain America's Rebellion". Metroactive News. Retrieved 2009-03-08. ^ Jason Haag (2004-04-01). "Wounded Warthog: an A-10 Thunderbolt II pilot safely landed her "Warthog" after it sustained significant damage from enemy fire". Combat Edge. Retrieved 2014-12-23 – via thefreelibrary.com. .
^ "Kim N. Campbell. Distinguished Flying Cross". Hall of Valor. Military Times. Retrieved 2014-12-23. ^ Capt. Kim Campbell USAF (2004-03-04). "GE Aviation Lecture. They Call Me "Killer Chick"". GE Aviation Lecture Series. Smithsonian National Air and Space Museum. Archived from the original on 2013-05-14. Retrieved 2014-12-23. ^ Myers, General Richard (2003-05-01). "25th Eaker Lecture. The New American Way of War". United States Air Force Academy. Retrieved 2014-12-23. This page was last edited on 12 April 2019, at 12:28 (UTC).